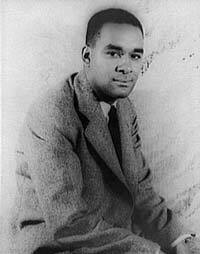 African American poet and author Richard Wright was born on September 4th, 1908 in Roxie, Mississippi. He published his first work when he was 16 years old. Later in life, Richard was employed by the Federal Writers Project where he received critical acclaim for a collection of four stories entitled, Uncle Tom’s Children. This African American writer is celebrated for the 1940 bestseller, Native Son, and his autobiography, Black Boy. Richard Wright was the son of Ella Wilson Wright, a schoolteacher and Nathan Wright, an illiterate sharecropper. He was largely raised by his mother who became single after the father deserted the family for another woman in 1914. Richard and his family survived in extreme poverty as they moved from community to community. This migrating lifestyle affected his education as he attended school sporadically. During this period of his life, Richard did several part-time jobs to help his family financially. In 1920, Richard Wright was sent to Jackson to live with his grandmother. Here, he enrolled in high school and graduated as the valedictorian. Richard moved to Chicago in 1927 where he found a job as a postal worker. In 1933, Richard was invited to attend a meeting held by the John Reed Club; one of the “cultural instruments” owned by the Communist Party. In the meeting, he was intrigued by what he termed as, “an organized search for the truth in the lives of the isolated and the oppressed.” As such, he started composing poetry that showed the positives of Communism. He quickly rose to the position of Executive Secretary of the John Reed Club which was later dissolved by the Communist Party. Richard Wright completed his 1st novel, Cesspool, in 1935. He also published some of his short stories and poetry. He moved to New York City in 1937 and kept himself busy writing articles for journals. In 1938, his first book, Uncle Tom’s Children, was published. The book consisted of several novellas that centered on racial oppression and isolation in the south. Richard moved to Brooklyn, after receiving the Guggenheim Fellowship award, where he completed what is considered as the most defining work in his writing career: Native Son. This is the book that put Richard on the radar of twentieth century literature, selling over 200,000 copies in less than a month. It vividly portrayed the bad conditions of the south as well as an intense sociological study. This gave Richard the recognition of a psychological suspense narrative. Black Boy, his second book, gained instant success upon its publication on 1945. By this time, he had fallen out with his friends in the Communist Party, becoming disillusioned with what he termed as, “ideological rigidity.” He moved to France in 1947, where his interest in anti-colonialist movement grew. He started associating himself with other successful thinker such as Jean-Paul Satre, George Plimpton, Leopold Senghor and Simone Beauvoir. Richard Wright died of a heart attack on November 28, 1961, at 52 years of age.